Tangerine is a best practice for publishing complex documents to interactive websites. When it comes to publishing online, existing software is complicated or outdated. Tangerine software helps you create plans that people will use. Based on its work with numerous public agencies, Urban Insight found that all too often, planners create important and potentially impactful plans that are published in a format that make them difficult to use. Instead of making an impact, these plans end up as hard copies on a dusty shelf or as an online PDF that is difficult to read on mobile devices — the devices your community members use. Urban Insight and planning firm MIG, Inc collaborated to create the Tangerine software as a service platform, as well as a sophisticated lead generation system, website and a variety of marketing products to introduce Tangerine to the planning community. 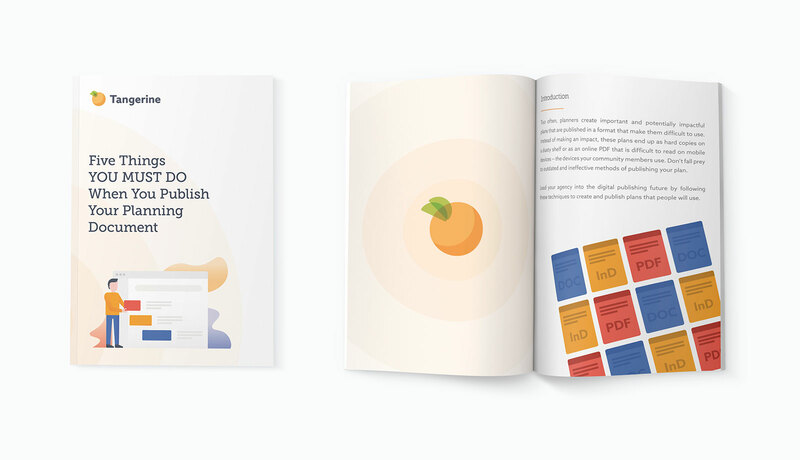 The Tangerine platform is easy to use, allowing users to convert complex planning documents to an interactive website within a few minutes. The system features a modern design, is searchable, integrates with a city’s geographic information system, is optimized for mobile and tablet devices, and is accessible to people with disabilities. "Tangerine software is a revolutionary product that will enable planners to have greater impact and reach with the plans they create. This product would not have been possible without the close collaboration with the great team at Urban Insight." — Steve Kokotas, Director of Technology, MIG, Inc.